The space planning of this kitchen has been one of the longest and frustrating projects. There have been so many factors to balance. Honestly, thinking about the space was often a case of mentally carrying too many groceries in from the car: a) you are constantly dropping something, and then b) forgetting you even bought that thing just 20 minutes ago and c) when you pick it up you drop a different thing, probably the eggs. It's just a mess. And then other folks really want to get involved and help you carry said groceries. Always with the best of intentions and love, but it just confuses you and makes you question literally everything. "Why did you even buy eggs? Just leave it them the driveway"
"Cause, I am making a scrambled eggs... is that bad?" "You know what's better than spaghetti? Cake. You should make cake!" "Yeah, I like cake, but it's not really right for the situation, but you could buy some..."
"If you are going to all the trouble of making a fancy meal, just hire a personal chef"
"Here, let me help you with that! Hey, why didn't you buy yogurt? Yogurt is always yummy"
"Thanks! I thought about it, and I can't remember right now why I passed on it, but it was a good reason -- oh dear, you just dropped the milk..."
All those dang groceries! This metaphor went on way too long, but it was also pretty accurate. Basically, there were so many constraints (given the needs of the house, the four doors into the room, the size of the space, the budget, what would be reasonable for anyone buying this house in the future, and my own aesthetic) that just the floor plan was a soup of compromises and not only was it exhausting trying to juggle all the reasoning in your own brain, but catching someone else up was nearly impossible. Which was exciting and terrifying. Exciting because it was a new idea, and better! Terrifying because I knew that having the appliances smooshed together like that was unusual. Would it look ok? Would it be functional? So I did some research. Both fact finding and civilian polling. This photo from a design blogger I follow was helpful in reassuring me that it wouldn't look too crazy. I mean, her whole kitchen was paid for by home depot and Martha Stewart cabinets (*jealous grumble grumble*), so they wouldn't want to sponsor something that would be too insane, right? Then I asked some experts about the function. The cabinet rep was really concerned. She felt the range being right next to the fridge would be a safety hazard, something about all that electrical in one spot would be bad. And that when the oven was on, the heat would make the fridge need to work harder. Fair concerns. She voted "nay". But when I turned to my contractor, he reminded me that we have lived with an exposed side of a range for 4 years (the range at our apartment was just in the middle of the room) and it doesn't get hot, because safety, so it wouldn't make the fridge work harder, and he would take care to put the appliances on separate circuits, and the wiring well insulated. So he voted "sure"
Then I asked friends and family if it would bother them to cook next to the fridge. Most said they would be fine with it, especially if that meant a longer run of uninterrupted counter space. And so that became the new plan. When we started laying out how exactly the new cabinet boxes would fit together, it was coming out wonky. The upper cabinets were going to be insane because of all the different heights between the standard upper cabinet, the above the microwave cabinet, and the above the fridge cabinet. And we were still left with a mostly unusable corner or countertop. I had a breakdown. I didn't want to be making choices that cost thousands and thousands of dollars if the result wasn't good enough. I didn't want to make choices about the kitchen that the next owners would disagree with and just rip out. What if we were not actually going to sell this house in the next few years because we can't afford to move while staying in our fashionable neighborhood? Should we triple our budget, build a second story "for the kids" and then turn the 2nd bedroom into a big kitchen? I probably won't ever be able to have the all the animals I want because this house is too small and we will be here forever. 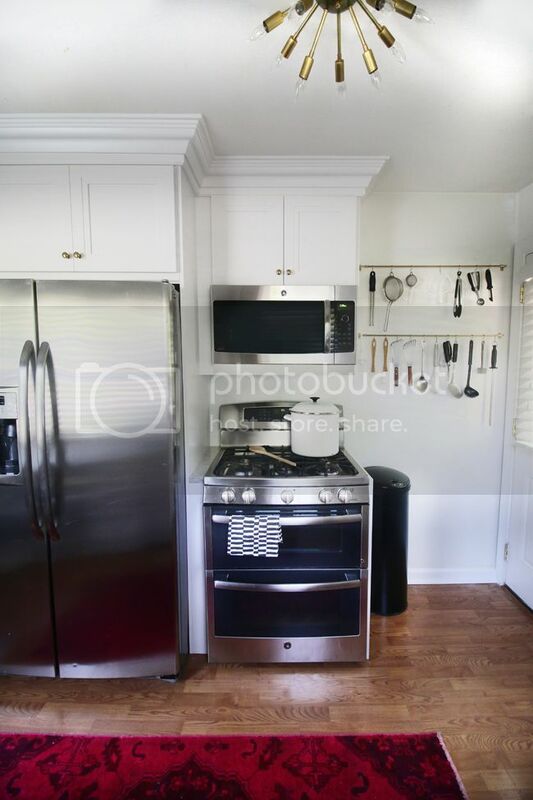 Should I just invest a few thousand dollars and make the whole kitchen open shelving, and let the next owners do what they want? Should I quit this whole design thing and go into "computers"? Ansel seems to like it. Am I ever going to see my family again? What!? Oh crap oh crap oh crap, I am hyperventilating. Woah. Too deep, too deep. Back to kitchens, no emotions! Bleh! I explained my freak out (in a casual, self deprecating, super chill way) to the cabinet designer/rep, and she offered to come by the house, and see if she could come up with yet another plan. I was seriously skeptical, but I said ok.
And by george, she came up with a new plan! A good plan! Woooooo! By moving the doorway into the hall just the right amount, we were able to make use of the wall between the kitchen and bedroom, but still have a use-able coat closet! Twas a miracle. Well, not really, it was the best option. We juggled a lot of things, and made critical choices (like not having a pantry in the hall, and slightly narrower doorways) but I think it all came out for the best. First, I can see that last view from the bed right now, and it is totally eerie. Second, I am exhausted. Reliving harrowing choices and panic attacks is quite a thing. The good news is, I really do think we made the right choice layout wise. Am I living "omg-so-much-money-did-i-do-everything-I-possibly-could-to-make-it-perfect: The Sequel" right now as the cabinets are being installed? Yeah totally. But I only cried in one short burst, and I really think that this kitchen is going to be so so good, and worth it, and appealing to buyers, and its really all a learning experience anyways. Oh so zen. So there you have it. The evolution of our kitchen space planning. You are sorry you asked about it, I know. Oh well. I am off to go find one of those mini zen sand gardens to compliment my new found wisdomosity, and for the kitties to knock over into the rugs.